Morocco is my favorite port so far on our voyage. One reason I think this is, is because before arriving Morocco I had no expectations of it. This allowed me to love the country so much. Another reason why I loved Morocco was because it is vastly different than the ports we went to in Europe. The ports in Europe are very similar to the United States, and in Europe it is more difficult for me to realize I left the United States—from hearing American music, seeing American clothes, etc. 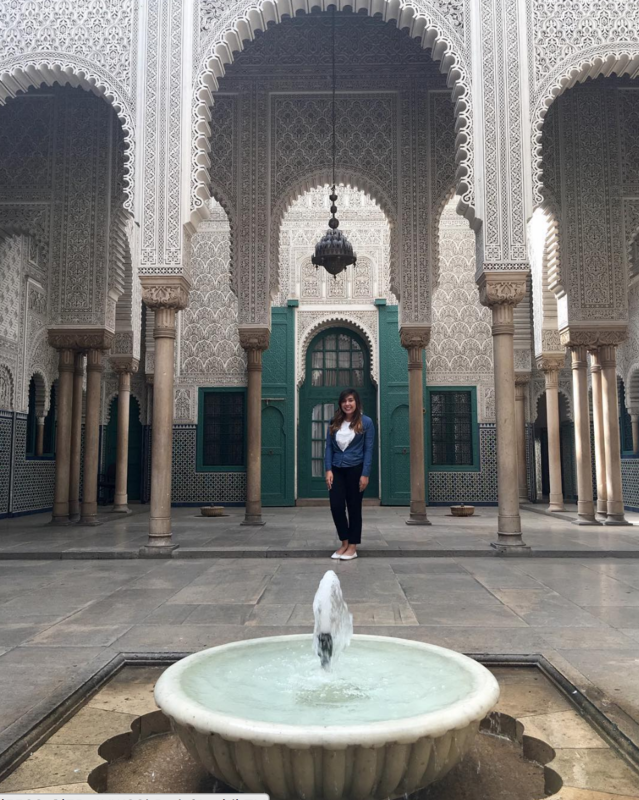 Morocco is the first country where I felt an actual culture shock. We learned in Global Studies that there are 4 stages of Culture Shock. The first stage is the “Honeymoon” stage. In this stage, it was so exciting to see the absolute beauty of Morocco. The first place I was able to visit was one of the King’s Palaces, which is so amazingly beautiful. I felt like a princess walking around as I admired the architecture, the gardens, and the fountains. The Mosque near the port is also amazingly beautiful and I was in awe to hear and see many people in prayer around the Mosque. The actual “Culture Shock” is the second stage. Here, you start to look for differences (usually negative) that compare to your home country. I hit this stage when I had to pee in a hole in one of the bathrooms. I thought Morocco didn’t have toilets, but it turned out they have both holes and toilets. Some places in Morocco I found are dirty, and this was something I compared to not seeing in the United States. The third stage is “Gradual Adjustment”—this is the stage where you tell yourself “I’ll make the best with what I have.” Every day, we almost had the same meal everyday. Different breads for breakfast, chicken tajine for lunch, beef tajine for dinner, and mint tea with every meal. Having something similar everyday can get tiring, but I learned to appreciate it because when will I ever be able to eat in Morocco again. Another way of adjusting to Morocco is the way that the locals treat tourists. Every time I met a local, they always made me feel welcome and always said “Welcome to Morocco.” In addition, when we ate at restaurants, they always took us to beautiful palaces to eat. They also would bring out music and belly dancers. At one palace, they surprised us by having a DJ outside while teaching us some Moroccan dance moves. Finally, the fourth stage is “Feeling at Home” and adapting to the new country’s culture. My heart will always be in Morocco. I had such a great time. Taking part in the Camel Trek field program was the best thing I’ve done with Semester at Sea thus far. I was able to explore so many different regions of Morocco. 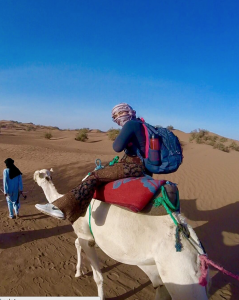 I rode a camel in the Sahara Desert and made meaningful conversations with my guide. I watched the sunset and sunrise everyday and saw millions of stars in the night sky. Morocco will always be a place I’ll never forget. My experiences in Morocco can never be replaced or recreated anywhere else in the World.